to get instant updates about 'Baja, Hungary' on your MyPage. Meet other similar minded people. Its Free! Baja () is a city in Bács-Kiskun}}, southern Hungary. 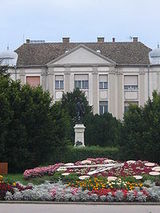 It is the second largest city in the county, after the county seat at Kecskemét, and is home to around 37,000 people. It has several road and a railway connection to other parts of the country, and also offers local Public transport for its residents. The city's Hungarian name is derived from a Turkic language or less likely Croatian. The name means "bull".